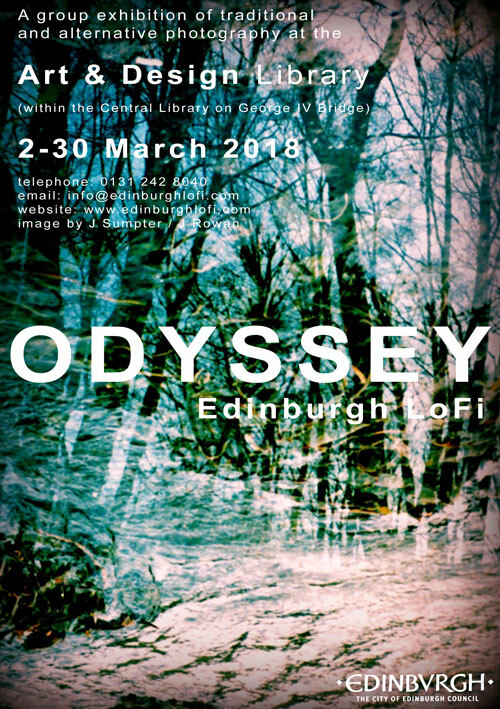 Edinburgh LoFi’s new exhibition Odyssey explores the journey and what it means to come home. This latest exhibition takes its title from the peregrinations of Homer’s legendary Greek hero, Odysseus. The photographers had the freedom for liberal interpretation; visually presenting a personal photographic journey, encompassing life’s progress, development and occasional set-backs. These wanderings might also be a recording of a memorable episode or a momentary glimpse during travel or sojourn, recorded on film and printed as the artist chooses, following the ethos of traditional and alternative photographic techniques. The group use a wide variety of cameras and methods , from pinhole (some hand-made) and analogue (film) to camera-less produced images, e.g. cyanotypes or chemigrams. We hope you find these pictures interesting and intriguing!